This photo shows Ohio’s four announced Democratic candidates campaigning to succeed Republican Gov. John Kasich including Dayton, Ohio, Mayor Nan Whaley, top left; then-U.S. Rep. Betty Sutton, top right; then-Ohio state Rep. Connie Pillich, bottom left; and Ohio state Sen. Joe Schiavoni, bottom right. The four current Democratic candidates will stage their first debate in the race for their party’s 2018 nomination for governor on Sept. 12 at Martins Ferry High School in eastern Ohio, Ohio Democratic Party Chairman David Pepper said Monday. CINCINNATI — Ohio Democrats plan to kick off a series of debates for their party’s 2018 governor nomination next month in eastern Ohio, their state chairman said Monday. The four current candidates will meet Sept. 12 at Martins Ferry High School in a region where Republican Donald Trump ran strongly in the 2016 presidential race. Pepper said they hope to debate in all of the state’s regions, with possibly three debates this year and three more next year. He said Democrats want to highlight that they will be the candidates of change and what the impact of Republican policies has been in the state. Democrats are trying to bounce back from a Republican sweep of 2014 statewide races, and to help Democratic U.S. Sen. Sherrod Brown hold onto his seat in his 2018 re-election race. 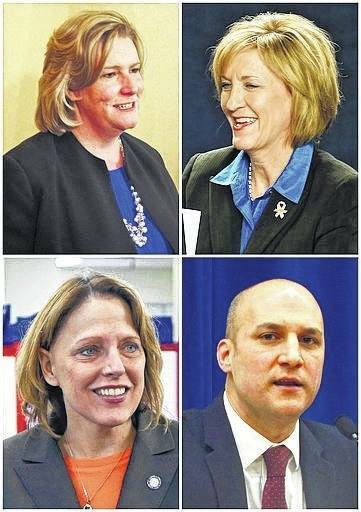 The four announced Democratic candidates are former U.S. Rep. Betty Sutton, Dayton Mayor Nan Whaley, former state legislator Connie Pillich and state Sen. Joe Schiavoni. The Republicans have three statewide officeholders and a fourth-term congressman running to succeed two-term GOP Gov. John Kasich, a 2016 presidential challenger to Trump who is term-limited. They are Attorney General Mike DeWine, Secretary of State Jon Husted, Lt. Gov. Mary Taylor and Rep. Jim Renacci. Pepper said he doesn’t expect the party to endorse a candidate during the primary. Other candidates still could jump in, including former Attorney General Richard Cordray. Pepper said Monday he doesn’t know whether Cordray will run, but said with debates beginning, candidates should make up their minds soon. “The campaign is starting,” he said. https://www.delgazette.com/wp-content/uploads/sites/40/2017/08/web1_OHIO-DEMS-081517.jpgThis photo shows Ohio’s four announced Democratic candidates campaigning to succeed Republican Gov. John Kasich including Dayton, Ohio, Mayor Nan Whaley, top left; then-U.S. Rep. Betty Sutton, top right; then-Ohio state Rep. Connie Pillich, bottom left; and Ohio state Sen. Joe Schiavoni, bottom right. The four current Democratic candidates will stage their first debate in the race for their party’s 2018 nomination for governor on Sept. 12 at Martins Ferry High School in eastern Ohio, Ohio Democratic Party Chairman David Pepper said Monday.